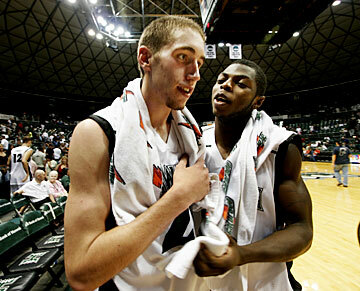 Matt Lojeski and Deonte Tatum celebrated after the Rainbow Warriors defeated Utah State yesterday at the Stan Sheriff Center. Thanks to a second-half surge on both ends of the court and a big day from a wounded guard, Hawaii got a head start in the Western Athletic Conference basketball race with a 69-59 win over Utah State yesterday at the Stan Sheriff Center. A crowd of 5,103 watched Hawaii (4-2) limit Utah State (4-3), the nation's leader in field-goal percentage, to just seven field goals after halftime and hold the Aggies to a season-low 35.7 percent shooting from the field. The Rainbow Warriors, meanwhile, went 15-for-26 from the field in the second half to win their Western Athletic Conference opener and spoil the Aggies' debut in the league. "I thought we did much better defensively," UH coach Riley Wallace said. "You've got the leading field-goal percentage team in the country and we didn't give them any good looks in the second half." Hawaii guard Matt Lojeski, playing with a sprained left shoulder, scored a season-high 20 points on 8-for-11 shooting from the field (4-for-7 from 3-point range) and hounded Utah State's leading scorer on defense. Lojeski finished with three blocks and two steals and helped hold Aggies guard Jaycee Carroll to a 5-for-14 shooting performance. "That young man is a tough kid, because it hurts," Wallace said. "He was able to shrug it off and play." It was a much happier ending for Lojeski than the previous Saturday. The junior from Racine, Wis., was held to six points and suffered a sprained shoulder in a homecoming loss at Wisconsin-Milwaukee. His family made the trip from the mainland for yesterday's game and Lojeski gave them a game to remember. "I didn't want them to think they were bad luck or anything," Lojeski said. "It means a lot to come out and play for them, but mostly play for the team and get the win." It was the second time in as many meetings that a UH guard posted big numbers against Utah State. Lojeski's performance conjured memories of Michael Kuebler's 28-point outing against the Aggies in the 2004 National Invitation Tournament. "It seems like our 2 guards have a good time playing Utah State," forward Julian Sensley said. "It was a good game for Lojeski, especially coming off that game in Milwaukee." Sensley finished with 19 points and grabbed all seven of his rebounds in the second half. Forward Ahmet Gueye had 12 points, eight rebounds and four of UH's season-high nine blocked shots. Along with holding Utah State to 7-for-32 shooting in the second half, UH also outrebounded the Aggies 24-13 after the break. "You look at the percentages, it's amazing we were even in the game at all," Utah State coach Stew Morrill said. Lojeski shadowed Carroll most of the game and held him scoreless most of the second half. Carroll, who entered the game averaging 20 points, finished with a team-high 15. Forward Nate Harris added 12 points, eight coming from the free-throw line. "I felt they did a good job of guarding, they contested shots very well," Carroll said. "I almost face-guarded him because he was coming off pick after pick, and just limited his shots," Lojeski said. Hawaii led for most of the first half and opened up a 28-20 cushion on Lojeski's steal and layup with 3:57 left. But Utah State closed with a 15-4 run to take a 35-32 lead into halftime. "We started the game with a lot of intensity, we were getting a lot of shots inside, and toward the end we started settling for jump shots," Sensley said. "Coach got on us about our intensity and trying to start the second half how we started the first half. We started throwing the ball to our big guys and they were able to finish and that kind of opened it up for the rest of us." UH started the second half on a 12-3 run and led 44-38 when Deonte Tatum's jumper bounced in to beat the shot clock. Utah State leapfrogged ahead at 47-46 on Chris Huber's 3-pointer with 11 minutes left. But the Aggies managed just one field goal over the next 8:30 and Hawaii pulled ahead for good. "We missed some open shots and we took some bad shots because of their defense," Morrill said. UH forward Matthew Gipson, shut out in the first 29 minutes, scored the game's next five points to spark a 13-3 run to give the Rainbows control of the contest. Utah State arrived in town late Friday night due to final exams this week and had a quick turnaround for yesterday's 1 p.m start. But the Aggies said the travel didn't factor in the loss. "I always think that's a bunch of crap," Morrill said. "People cry and whine. Be a man, admit you got your (behind) kicked and don't talk about that." Hawaii, in the midst of a seven-game homestand, faces Loyola Marymount on Tuesday to open the Outrigger Hotels Rainbow Classic. Halftime -- Utah State 35, Hawaii 32. 3-point goals -- Utah State 5-18 (Carroll 3-6, Huber 1-1, Pak 1-4, Harris 0-1, Session 0-1, Peterson 0-5), Hawaii 6-16 (Lojeski 4-7, Sensley 2-7, Gipson 0-2). Personal fouls -- Utah State 14, Hawaii 16. Steals -- Utah State 5 (Carroll 2, Matheus, Harris, Session), Hawaii 7 (Gipson 2, Lojeski 2, Sensley, Gueye, Wilder). Blocked shots -- Utah State 2 (Matheus 2), Hawaii 9 (Gueye 4, Lojeski 3, Gipson 2). Turnovers --Utah State 12 (Pak 3, Carroll 3, Matheus 2, Spicer 2, Harris, Session), Hawaii 14 (Gipson 3, Gueye 3, Lojeski 2, Tatum 2, Zivanovic 2, Botez 2). Officials -- Gracey, Littlewood, Danner. A -- 5,031.